A feeling of foreboding and damnation builds up in the narration from the first frame itself. Here's a gloriously gutsy film exploring the underbelly of Mumbai through the lives of two slum kids who grow up in identical circumstances, but with somewhat disparate values. First-time director Faruk Kabir displays remarkable skill in creating a pastiche of mammoth crime and little punishment. The pace leaves meagre space for grace. And yet "Allah Ke Banday" creates a world filled with acute aggression, repression and damnation with a reasonable amount of paciness to the edgy narrative. The world that Faruk Kabir's characters inhabit is reminiscent of Danny Boyle's "Slumdog Millionaire", Irrfan Kamal's underrated "Thanks, Maa", Mahesh Manjrekar's "City Of Gold" and Chandan Arora's "Striker". Deriving its lingering study of juvenile delinquency from these sources "Allah Ke Banday" moves forward and acquires a life of its own. The gripping narrative takes us through the world of petty crime and underage lawlessness non-judgementally. Faruk Kabir's deeply-felt concern for children who dodder dangerously on the edge of society is never overdone. The director creates a world of uncertainties with unwavering confidence. The nervous anxiety of the characters is rather aptly replicated in the film's rough and unvarnished look. 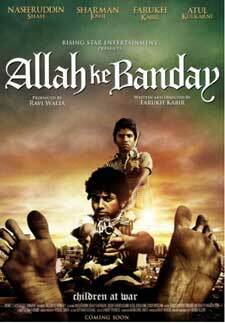 Kabir's cameraman Vishal Sinha goes through the rugged merciless slums searching for only Allah-knows what. The actors wear their unwashed demeanour casually, so much so that at times we forget the existence of the camera. At the same time, there are uneven sections in the narrative that mar what could otherwise have been a standout exposition on the genesis of social outcasts. Sharman Joshi and Faruk Kabir play the two driving forces of the plot with a deep understanding of their characters and the milieu. Both seem to have got right their characters' physicality and then proceed to explore their inner worlds. For a first-time actor and director, Faruk Kabir handles both his jobs with more than a reasonable amount of compelling confidence. The others in the cast merge into the relentless milieu. As usual, the extraordinarily brilliant Naseeruddin Shah is under-used. Whenever he shows up on screen, an extra dimension is effortlessly added to the proceedings. Notches above the run-of-the-mill entertainer is the genuine concern for juvenile delinquency. The lives on the streets never looked more dangerous and less glamorous. This time, crime is not glorified. Thank god for small mercies.